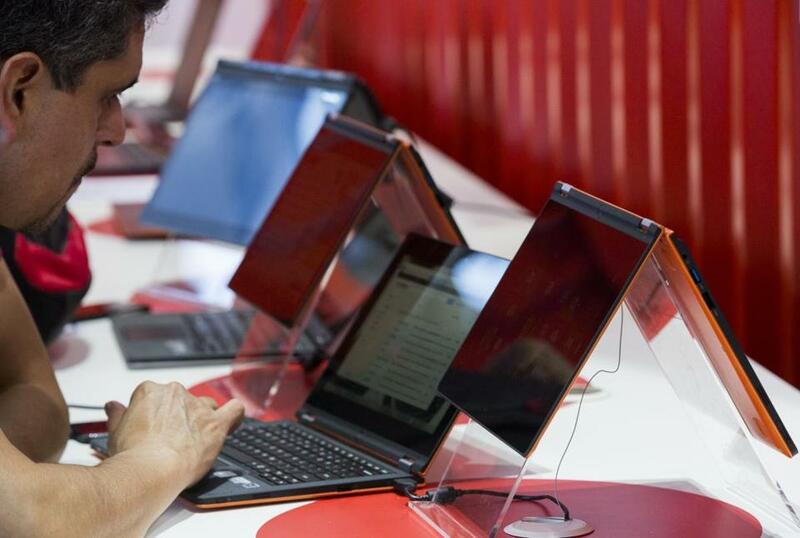 Lenovo Yoga 2 Pro ultra books are displayed at the IFA electronics show in Germany on Sept. 5. Many new devices are cluttered with programs that you never installed, never requested, and many not want. There’s nothing like the fresh, clean feeling of unboxing a brand-new computer or smartphone. Too bad the feeling usually comes to an end the moment you hit the power button. Almost every Windows computer and Android device on the market is cluttered with “bloatware,” programs that you never installed, never requested, and may not want. These can include preinstalled games, browser toolbars, or trial versions of antivirus programs. Software companies pay the computer makers to include these extras, and given PC makers’ paper-thin profit margins, they are glad to cash the checks. Bloatware isn’t all bad — you might end up buying that antivirus program. But it can also slow down your machine and waste valuable storage space. And every now and then, these unwanted programs will even threaten your privacy. Late last month, the Chinese computer maker Lenovo admitted that a bit of bloatware preinstalled on its machines could have helped hackers steal users’ sensitive data. For several months, new Lenovo laptops came with a program called Superfish, which would display advertisements inside the users’ Web browsers. But Superfish also broke the browser’s encryption system, which lets us safely pay our bills and do our banking online. Criminals could have set up fake websites masquerading as, say, Bank of America, and Lenovo users would never have known the difference, till their passwords were stolen and their bank accounts drained. It has been a fiasco for Lenovo, but we may all benefit in the end. On Friday, the company announced that it was dropping not only Superfish, but also its bloatware programs. Later this year, when Lenovo starts selling machines with Microsoft Corp.’s upcoming Windows 10 operating system, its PCs will feature only the minimum software needed for safe operation. And Lenovo promised to include descriptions of every installed program, to help the owner decide whether to uninstall it. PC buyers who hate bloatware now know which brand to buy. You can also buy unbloated Windows computers directly from Microsoft. The company’s online store offers “Signature Edition” machines from leading vendors such as Lenovo, Dell, Acer, Asus, and Toshiba. Microsoft charges a little more than other retailers for the same computers, but you get a machine that’s bloatware-free. If you’ve recently bought a computer stuffed with annoying little programs, it’s not too difficult to clean it up, using Windows’ uninstall feature. Better yet: Check out Should I Remove It? That is a free program that looks at all your PC’s applications, tells you what they do, and helps you pick off the useless stragglers. Apple fans are reading all this with bemused chuckles, since Apple doesn’t let other software companies add bloatware to Mac computers. The same goes for iPad tablets and iPhones. Not so for fans of the Android operating system, where bloatware is all too common. Indeed, it’s more annoying than the PC variety, because in many cases the apps are “immortal” — you can’t uninstall them. Unwanted programs are often installed by the cellphone company. For instance, my HTC One Android phone contains about a dozen apps under the brand of my carrier, AT&T. I don’t want any of them. For example, I won’t bother with AT&T’s Navigator app when I can just as easily run the excellent Google Maps. But I can’t remove Navigator or any of the other AT&T apps. And when I asked why, an AT&T spokeswoman declined to comment. Like junk programs on a PC, these unneeded apps often run in the background, slowing down my phone and using valuable memory. It’s especially annoying when I’m running low on storage space for music and photos. I could save quite a few megabytes by wiping the AT&T apps, but I’ve had to delete videos instead. There are highly geeky ways to kill these immortal apps, but you’ll void your warranty. For a safer alternative, you can purchase a “stock” Android phone, which contains only the pure operating system from Google Inc. You can find such phones at Google’s own online Play Store or on Amazon.com. These are no-contract phones, and you must pay full price — up to $650 for a top-line Android like the Motorola Nexus 6. Luckily, cell carriers Sprint and T-Mobile offer a bloatware-free Nexus 6 on a pay-as-you-go basis. And while AT&T’s version of the Nexus 6 contains some annoying extras, users are permitted to delete them. Still, most new phones and PCs will arrive in our homes as bloated as ever. Profit-hungry companies will never stop, until we make them.